​Join the best band in the land! Why Should I Join The Band at Pebblebrook High School? 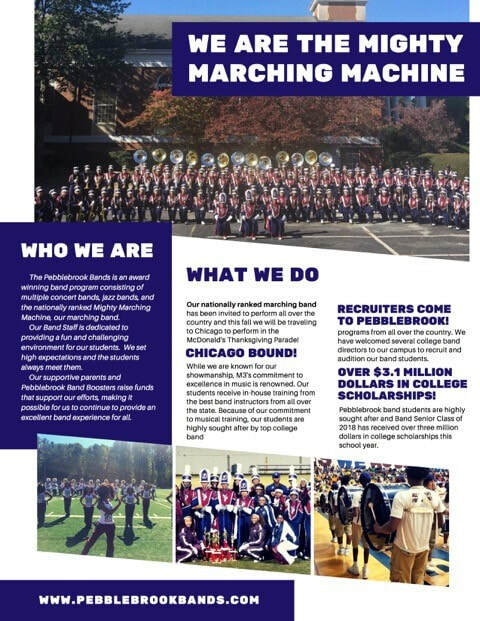 Please visit www.pebblebrookbands.com for additional information on our band program .If you have any additional questions contact us at the band room; Mr. Kirtdoll or Mr. Wimberly (770) 819 2521 ext 083 or at pebblebrookbands@gmail.com. 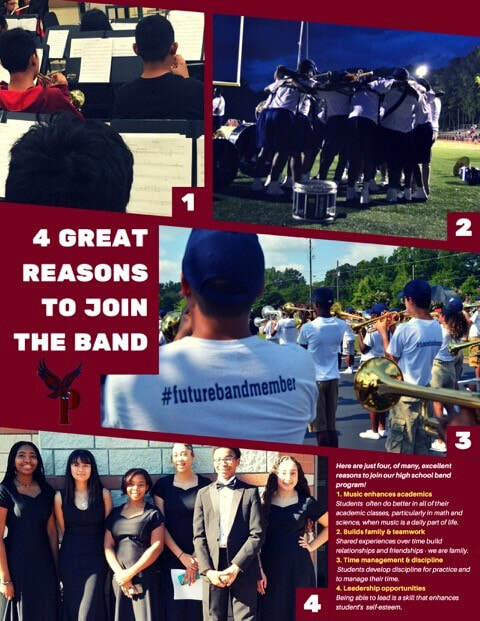 Other Reasons to Join The Band! In an analysis of U.S. Department of Education data on more than 25,000 secondary school students, researchers found that students who report consistent high levels of involvement in instrumental music over the middle and high school years show "significantly higher levels of mathematics proficiency by grade 12." This observation holds true regardless of students' socio-economic status, and differences in those who are involved with instrumental music vs. those who are not is more significant over time. Catterall, James S., Richard Chapleau, and John Iwanaga. "Involvement in the Arts and Human Development: General Involvement and Intensive Involvement in Music and Theater Arts." Los Angeles, CA: The Imagination Project at UCLA Graduate School of Education and Information Studies, 1999. A 1997 Gallup Survey on Americans’ attitudes toward music revealed that 89% of respondents believe music helps a child’s overall development, and 93% believe that music is part of a well-rounded education. Americans’ Attitudes Toward Music, The Gallup Organization, 1997. According to a 2000 survey, eighty-one (81) percent of people responding believe that participating in school music corresponds with better grades and test scores. This is an increase of fourteen (14) percent over the 1997 results for the same question. Attitudes, NAMM (International Music Products Association), 2000. More music teachers are role models for minority students than teachers of any other subject. Thirty-six (36) percent of surveyed minority students identified music teachers as their role models, compared to twenty-eight (28) percent for English teachers, eleven (11) percent for elementary teachers, and seven (7) percent for physical education teachers. “Music teachers as role models for African-American students,” Journal of Research in Music Education,1993. Ninety-two (92) percent of people who play an instrument say they were glad they learned to do so, according to a 2000 Gallup Poll. Gallup Poll Shows Strong Support for Putting Music in Every School’s Curriculum, Giles Communications, 2000. Music Making and Our Schools, American Music Conference, 2000.